Today I have the first polish from my most recent haul. I had never seen or heard of Famous by Sue Moxley when I saw it in Superdrug so I had to buy a couple of things just to see if I liked it, and I do! I understand the brand has been around for a few years in selected stores but I guess those stores where never anywhere near me! This is called Purple Dazzle and it's a dark purple glass fleck polish with a slight duochrome. I say slight because I didn't notice it until I started taking photos! The colour shift goes from purple to gold and it's really pretty in a subtle way. I had so many problems trying to get a colour accurate photo of this! It kept photographing as blue, even though it's definitely 100% purple. In the end I fiddled about with my white balance, so if my skin looks a bit off colour then it means the colour of the polish is right! 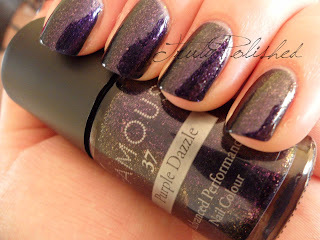 In the photos below I'm wearing two coats of Purple Dazzle with a coat of Seche Vite. Click "Read More" to see the rest of my photos. I love this polish so much! Purple isn't usually my colour but I'll make an exception for this subltle duochrome. If you'd like to buy this, have a look in your local Superdrug and if they stock Famous by Sue Moxley, you'll find this polish for sale at £4.50. OH wow this is beautiful. Purple is my fav color.